"Oh why has he disappeared, this feeling is really weird. You're precious and you're dear, can you feel the weight of these tears?" Nonsense. To her credit, she was only 20 years old at the time. Unfortunately, after her first, very successful single "Doin' The Do", the comic value of Betty Boo wore very thin, very fast. However, her undeniable success - essentially the carbon copy of an American blueprint - made it imperative to... export her sound back to America! And so it was that Shep Pettibone came to work on "Where Are You Baby", toning down the saccharine side of the 'song', stealing a bit of Salt 'n' Pepa bassline for extra cred and finishing up with a half decent version, altogether darker with the majority of the track devoid of Boo's oh-so-amusing rap. 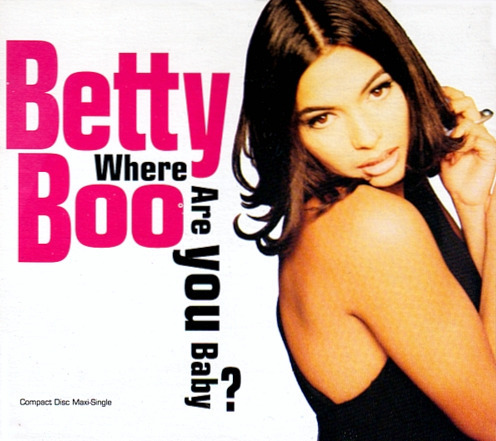 The sleeve of the single was toned down too, with less comic-strip posing and more sultry pouting (and extra flesh). Funnily enough though, the passing of the years has helped me reevaluate the Pettibone mixes, and I can now appreciate them as extremely well programmed, with a lot of extra punch (rather than the original, deliberate soft waddle they had in the UK versions). Have a listen! The US CD-single is not so easy to get hold of now, so hopefully some people will appreciate finding the Pettibone vocal and dub in good quality from a CD rip (I couldn't find anyone else offering it on the web). I'm including the other US-specific mixes in the package too. Once again (and I say it so often I don't even know why I bother any more), these mixes are now unavailable to buy. Anyway, enjoy.